Hans Theo Baumann is dead. 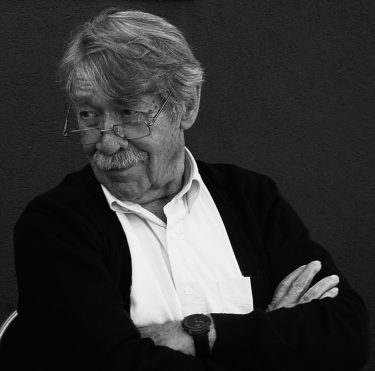 The influential pioneer of German post-War design died on Saturday, August 6, 2016, aged ninety one. Born in Basel, Switzerland in 1924, he followed in his father’s footsteps and trained as a stained glass artist. After World War II, a simple turned wooden box and cover he had made in Bernau in the Black Forest found its way into the hands of the young Philipp Rosenthal, convincing the latter of Baumann’s talent as a designer. 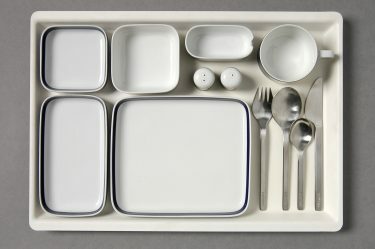 This resulted in a collaboration with the porcelain factory Rosenthal in Selb that lasted many years. Countless of Hans Theo Baumann’s designs were executed by the company, which like few others is now seen as synonymous with the emergence of a democratic way of life in post-War Germany. Baumann was one of the “seven young rebels in red ties”, who, championed by Design Centrum Stuttgart’s grande dame Mia Seeghers, revolted against the titans of German pre-War design. Together with Dittert, Kupetz, Raacke, Schütze, Slany, Votteler and the older Bauhaus alumni Herbert Hirche, Hans Theo Baumann shaped and defined the notion of a German post-War industrial designer. In 1959 the VDID, the Association of German Industrial Designers, was founded with Baumann as its first president. Baumann’s extensive portfolio includes designs for more than 50 firms in Germany and abroad; indeed, it forms a veritable Who’s Who of post-War companies and by extension of design history. 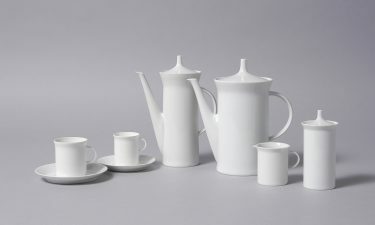 Baumann worked with porcelain, glass and ceramics, with metal, textiles and plastic, created lamps and furniture, as well as graphic designs. Few objects of daily use did not rouse the passionate Porsche driver’s interest. His glass vessels (1952) manufactured by sheet glass producers Lamberts in Waldsassen playfully struck a balance between art and function, his design for a Perspex shell chair for Vitra (1952–53) is still regarded a prime example of its kind in Germany, his on-board tableware for Lufthansa (1963–64, 1971, 1986–87) set new standards in the sphere of system tableware, his glass window for the Matthäuskirche church in Pforzheim (1953), designed by architect Egon Eiermann, formed the basis for the glass windows of his Kaiser-Wilhelm memorial church in Berlin, and Baumann’s own wine, grown in France, provided an opener for many a discussion on design. And of course the label for his wine bottles was designed by Baumann himself. His works were shown in important exhibitions from an early date, such as at the Milan Triennials of 1954 and 1957, and he won high accolades – including two gold medals at Expo 58 in Brussels. Correspondingly, strong foreign interest in this highly versatile and talented young German designer was kindled. In 1970 he established the professorship for ceramics at the National Institute of Design in Ahmedabad/India, in 1981 he travelled to Arita/Japan on the invitation of porcelain manufacturer Fukagawa, who make the chinaware for the Japanese imperial family. All of this did not preclude Baumann’s involvement with fine art – on the contrary, it was part of how he understood his existence as a human being, his work as a designer and artist. This gave rise – in a way that can almost be described as natural – to the foundation of the Kunstverein art society and exhibition space in his home town of Schopfheim in Baden-Würtemberg. In 2004, Hans Theo Baumann and his family donated a collection of his objects to Die Neue Sammlung. Examples of his preliminary work – sketches, work drawings and prototypes – provided important accents to the exhibition “Gralglas. 1930 for many a discussion on design 1981. An Example of German Design” held here in 2011. In 2014 Die Neue Sammlung followed this up with a detailed look at his work in ceramics with the exhibition “Hans Theo Baumann – From Series to One-Offs” held at Internationales Keramikmuseum in Weiden. Only four weeks ago did Hans Theo Baumann prepare the transfer of his archive to Die Neue Sammlung with the help of his family. We will all miss him, this titan of German post-War design, who with his prodigious output and ideas contributed to the project of returning German design to democratic expression and furthering its international renown. His impish roguish charm, his astute analyses paired with a grain of Alemannic bloody-mindedness and a mischievous twinkle in his eye, and his ability to think – and achieve – the impossible, right to the very end, cannot be imitated.